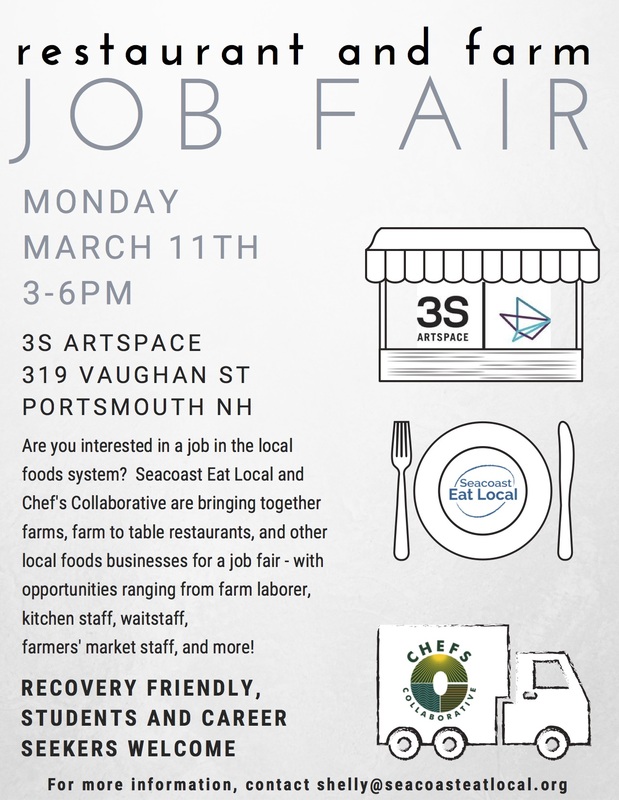 Seacoast Eat Local is proud to introduce Margo Clark as our incoming Market Outreach and Support team member! 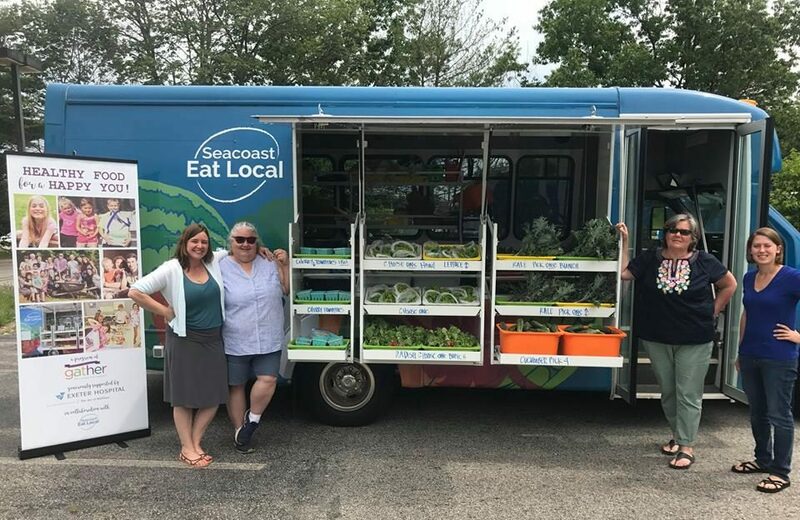 In Margo’s new, part time role with Seacoast Eat Local she will be supporting existing markets and coordinating expanded outreach efforts including advertising campaigns, information distribution and representing the organization at various community groups and committees. 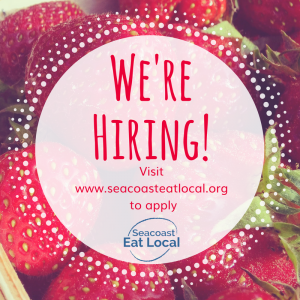 Seacoast Eat Local values Margo for her enthusiasm, passion and dedication and is excited to welcome her back in this new role. 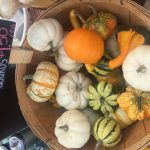 Kaidy’s Post: It’s Pumpkin Season! 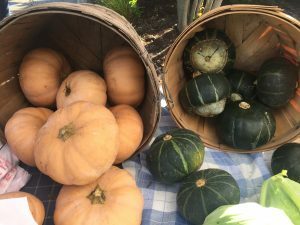 which includes several squash varieties, cucumbers and melons. There are over 45 varieties of pumpkins, ranging in color from orange to white to green. In one cup of pumpkin there 49 calories, 12 grams of carbohydrate, 2 grams of protein and 3 grams of fiber. There is also 245% vitamin A, 19% vitamin C and 16% of potassium, 11% manganese, 11% copper, 11% vitamin B2, 10% vitamin E and 8% iron of the daily recommended values. Pumpkin is filled with vitamins, specifically vitamin A and C, which support immune health, helping you to fight sickness and heal wounds. Also due to its low calorie, nutrient dense nature, pumpkin can help with weight maintenance and loss. Pumpkin seeds are also a great source of nutrition, containing 3 grams of fiber, 7 grams of protein, and 13 grams of polyunsaturated fats per one ounce serving, making them a filling snack to eat throughout the day. As fall begins to move into full swing, more and more people are picking up pumpkins for their fall decorations. The stores are filled with pumpkin spice flavored goodies and treats and families start to bake pumpkin stuffed treats. However, pumpkin does not have to be only reserved for sugar-filled pumpkin pies and cookies. 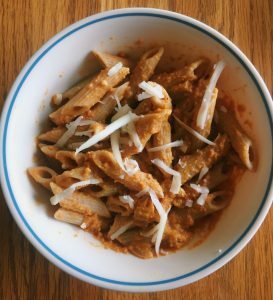 The recipe below is just one way to incorporate pumpkin into your healthy diet during the fall season. Cut a sugar pumpkin in half, from the stem to base. Remove seeds and pulp. Cover each half with foil. Bake in the preheated oven, foil side up, for 1 hour, or until tender. In a medium pot over medium heat, add the oil, onion, garlic, red pepper flakes, and dried sage and cook until onions are translucent, stirring occasionally. Add milk, pumpkin, salt, pepper, and nutmeg. Combine until a smooth, creamy sauce forms. Allow to heat through. Add prepared pasta and combine. Pro tip: Roast the leftover pumpkin seeds at 300 degrees Fahrenheit on a baking sheet with olive oil, salt and pepper for 45 minutes or until golden brown to use the whole pumpkin! 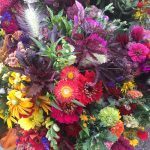 Posted in UncategorizedLeave a Comment on Kaidy’s Post: It’s Pumpkin Season! 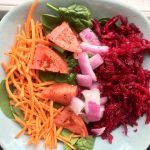 Roast vegetables on a baking pan for 20 minutes, tossing occasionally, add the beet greens and bake for 2 more minutes. Mix together with chopped apple and greens. Drizzle with salad dressing. Jessica’s Post: Summer Dill Pickles! My mom, aunt and I take care of our own garden at my memere’s house and the past couple years we have planted less cucumber plants but we still seem to run into the same problem, we still get too many cucumbers! We always seem to have more cucumbers than we need during the summer growing season so in order to not waste any, we have started to pickle them instead! Pickling is actually a really easy process and the perfect way to enjoy the excess amounts of cukes that many people seem to find themselves having during the summer months. I have written below my mom’s recipe for dill pickles, because, although I may be biased, they are super delicious! Please note that this is a recipe for “fridge pickles” and does not use a water bath canning method. As a result of this, these pickles must stay refrigerated and last approximately 1 month. My family sorta just uses this recipe as a guide and judges the amounts of each ingredient needed based on how many cukes we have available at that time. But I do recommend that if it’s your first time pickling that you follow the recipe to ensure you are getting the flavor desired! Below I wrote out the directions to help you prepare this delicious treat. Remove the blossom end of each cucumber and wash. Cut each cucumber lengthwise into about 6 spears. In a large bowl, combine the cucumbers, dill and garlic; set aside. In a covered pot, combine the remaining ingredients. Bring to a boil and cook and until the sugar is dissolved. Pour this liquid over the ingredients prepared in the first step (containing the cucumbers) and allow to cool. Transfer to jars and cover tightly (My family buys mason jars at the store). Refrigerate for at least 24 hours and store in the fridge for up to 2 weeks. 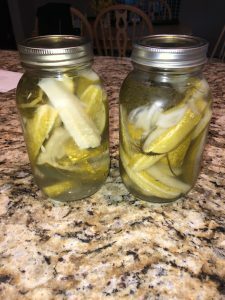 You should get from this recipe about 4 quarts of pickles! I have been enjoying the pickle recipe for many summers and it never fails to impress me! It really is quite simple although I know the process of making pickles can seem a difficult at first. If you love a good dill pickle like I do, I can guarantee you’ll enjoy this recipe! 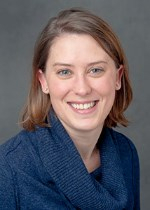 Posted in Intern Posts, UncategorizedLeave a Comment on Jessica’s Post: Summer Dill Pickles! 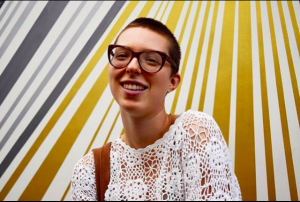 Morgan’s Post: Welcome Eggplant Season! 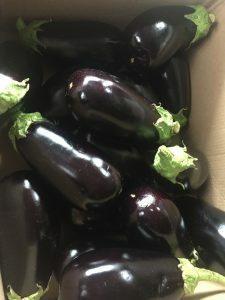 This Thursday the SAMM Van had a new piece of inventory from Three Sisters Farm in South Berwick, ME – eggplant! And let me tell you, these were HUGE! It seems that everyone was just as shocked and excited to see them because they cleared out very fast. There are so many things you can dowith them such as roasting, stir frying, stuffing, and grilling! Eggplants aid digestion, are full of antioxidants, and are a great source of fiber. They hang from vines that have the ability to grow several feet and have a deep-purple colored skin. To store it you should put the full eggplant – not cut up – in the fridge to be eaten within 2-5 days. My first introduction to eggplant and favorite experience I’ve had with it was at a restaurant in Texas where I had eggplant fries as an appetizer. Ever since then I’ve been trying to find places that serve them, but I’ve been out of luck. What I loved about them is that I didn’t feel guilty or gross after eating them and still had enough room for my meal. Because of this I decided to find an eggplant fries recipe that I can make myself! Place the eggplant slices on a wire rack on a baking sheet and bake in a preheated 425F oven until golden brown, about 7-10 minutes. 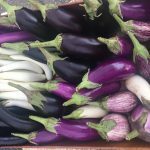 Posted in Intern Posts, UncategorizedLeave a Comment on Morgan’s Post: Welcome Eggplant Season! Seacoast Eat Local staff recently visited Giff Burnap, owner and operator of Butternut Farm in Farmington. The staff was eager to check out the ever-expanding PYO operation as well as the newly developed line of hard ciders, straight from apples grown on the farm! In the past year, Giff and his team built a new farm building with a commercial kitchen and basement cider brewing operation. 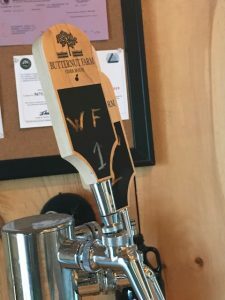 The building is licensed to sell alcohol and has three taps that connect directly to basement hold tanks for the various cider varieties. The commercial kitchen is where many other value added products like fruit pies and a cider donuts are produced for sale to the public during the PYO season from June-November. got into cider-making— he was inspired by our friends at North Country Cider in Rollinsford! According to Giff, he had tried many ciders, but frankly did find them to taste good. 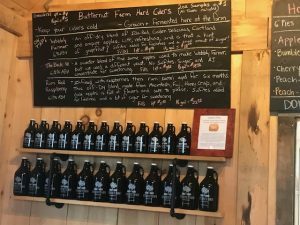 Then, he tried North Country’s ciders and was ‘inspired by their methods and products.’ That was the start of a home cider hobby that eventually led to a significant value added operation as part of the Butternut Farm business. This year, the Butternut Farm team produced 1400 gallons of cider and are on track to double that amount next year. Cider is sold on site only, and is only available in growler sizes. Part of the reasoning behind this is for ease– less overhead, transportation, bottling and shipping. However, Giff also seeks to maintain a top quality product, which he feels is currently best achieved with this sales strategy. All the apples in the ciders come right from the farm. Giff is beginning to focus in on specific varieties of apples with higher sugar content so that he can work towards the goal of cider- making with only yeast and apples (a small amount of sugar is currently used). For the record, this cider has the SEL seal of delicious approval! Of course, fruit farming is Giff’s first passion and the picking opportunities at Butternut Farm are no joke! They have a berry hotline which is updated daily with the latest picking conditions and prices. 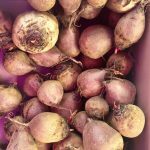 Butternut Farm has enormous variety of fruits on hand– all manner of strawberries, cherries, peaches, plums, raspberries, blueberries, apples, pumpkins and even tomatoes. 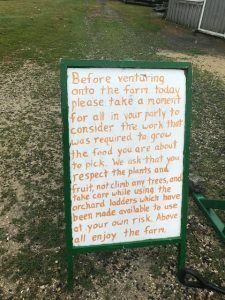 In remaining a PYO operation, Giff and the team can focus solely on ‘growing the fruit’ and ‘creating a quality, emotional experience for visiting families.’ The number of parents and grandparents with young children confirms Giff’s thoughts– his farm is truly a family affair for everyone involved.